If you're on the lookout for a casual yet seriously stylish look, opt for a black and white leather bomber jacket and grey wool chinos. Both pieces are totally comfortable and will look great together. For something more on the daring side to round off this ensemble, go for a pair of navy low top sneakers. If you don't like putting too much effort into your combos, consider teaming a black print crew-neck t-shirt with Jacob Cohen wool tailored trousers from farfetch.com. To bring out the fun side of you, complement your outfit with multi colored athletic shoes. If you're hunting for a casual yet on-trend getup, pair a charcoal crew-neck sweater with Jacob Cohen wool tailored trousers from farfetch.com. Both items are totally comfortable and will look great together. Throw in a pair of white leather high top sneakers for a more relaxed aesthetic. For a smart casual ensemble, dress in a black overcoat and Jacob Cohen wool tailored trousers — these two pieces play nicely together. Choose a pair of white athletic shoes to make the look current. 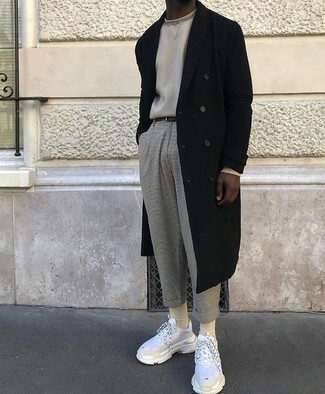 If you're in search of a casual yet on-trend look, choose an olive long sleeve shirt and Jacob Cohen wool tailored trousers from farfetch.com. As well as totally comfy, both items look great when worn together. Throw in a pair of black leather low top sneakers to make the look current. 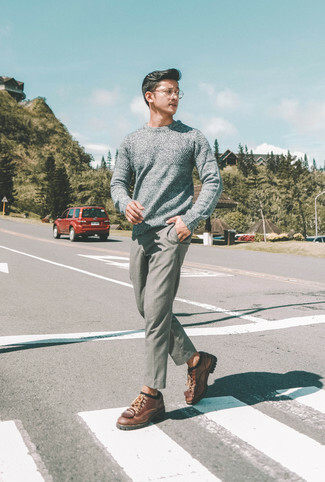 If you're searching for a casual yet stylish outfit, marry a grey crew-neck sweater with Jacob Cohen wool tailored trousers. Both garments are totally comfortable and will look great paired together. Up the cool of your look by wearing brown leather derby shoes. 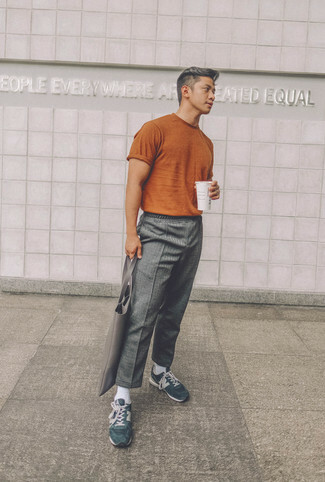 If you're searching for a casual yet on-trend ensemble, try pairing a tobacco crew-neck t-shirt with grey wool chinos. Both garments are totally comfortable and will look great together. 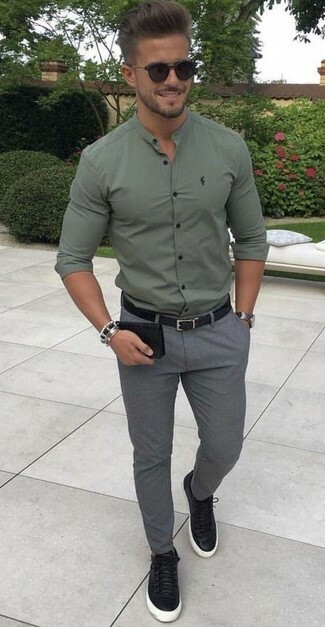 Grab a pair of dark green suede athletic shoes to make the outfit current. 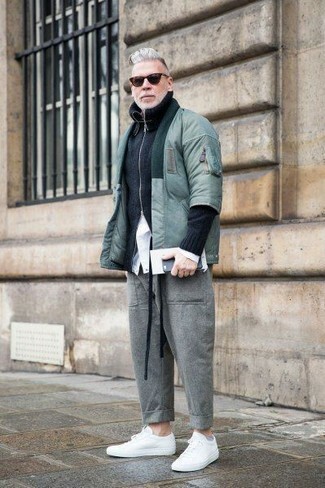 If you're after a casual yet sharp outfit, rock a mint bomber jacket with grey wool chinos. Both garments are totally comfortable and will look great together. For something more on the daring side to complement this ensemble, opt for a pair of white leather low top sneakers. 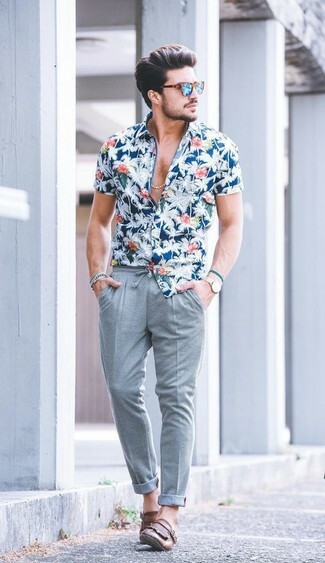 If you're hunting for a casual yet on-trend look, consider pairing a blue floral short sleeve shirt with Jacob Cohen grey wool chinos. Both of these items are super comfy and they will also look wonderful when worn together. Bring instant interest and excitement to your outfit with brown leather tassel loafers.